Yesterday was Epiphany, or the twelfth day of Christmas. You know, the one where the twelve drummers are drumming. That is Epiphany, the day we normally feast and take down out tree. However, since we were previously engaged last night we elected to celebrate Epiphany tonight, on the oft forgotten thirteenth day of Christmas. When I got home from work, after taking a lengthy nap, I made this capricho de cabra con tomate. 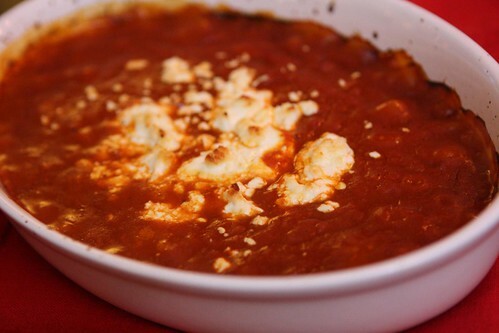 We had a delicious version of this whilst visiting family in Illinois earlier this week and I decided to recreate it in an incredibly lazy way by just melting some goat cheese in some tomato sauce in the oven. Given that this took about 45 seconds to prepare it was a good way of fending off our hunger until the main courses arrived. It also used up some past-its-prime bread from the freezer. 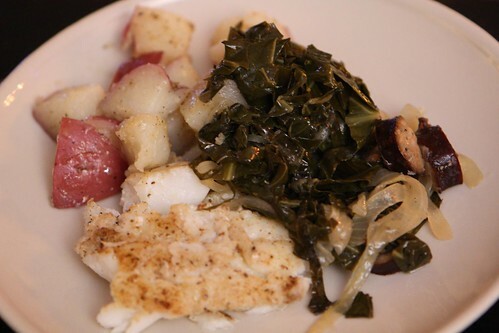 I took a somewhat lackluster cut of cod, thawed it out, and roasted it in the oven with olive oil, salt, pepper, and Old Bay Seasoning. The result was not pretty but was delicious. 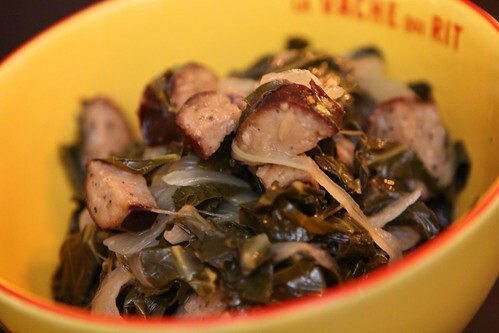 For a side dish I made collard greens with leftover kielbasa from New Year's Eve, onion, olive oil, butter, hot sauce, cider vinegar, salt, and pepper. 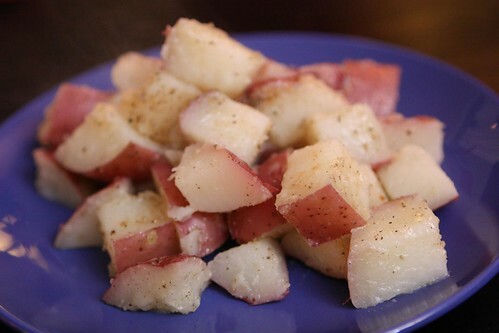 For the final side dish I boiled some New Potatoes then tossed them with butter, olive oil, salt, and pepper. And what beer does one pair with this final Christmas meal of the season? 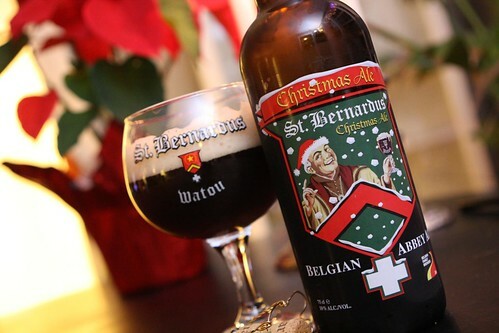 I chose the St. Bernardus Christmas Ale from Sint Bernardus. I'd been looking forward to this beer for some time. The end result was good but not great. It had a very heavy alcohol taste and I think might have been better served to be allowed to age for a year or so to mellow. To close out this Christmas holiday I made up the celebratory plate of dessert reminiscence. The plate contained Jen's fruit cake which still has not mellowed and will be at its peak in a year's time. 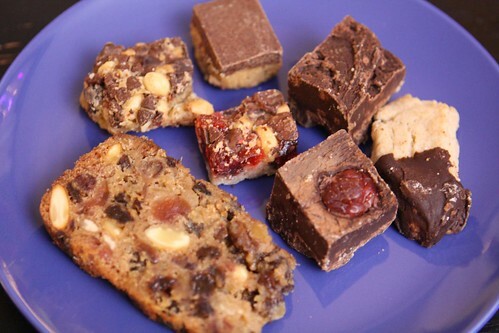 Also we had some peanut squares, magic bars, and peanut butter chocolate squares made by Jen's mother. Also some of Jen's fudge and shortbread cookies. There you have it. 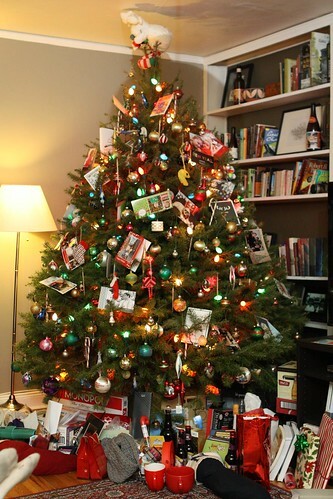 Tomorrow we will take down the tree and put a close on another eight-week-long Christmas celebration. What wonders will await us next Christmas? What will change? What will be the same? How will we continue our privileged life of excess? Well, I'm not telling. You're just going to have to keep reading and find out. It's not going to be that exciting.